Over the years I’ve developed a deep appreciation for publisher Devolver Digital. They’re substantial enough to publish arty indie titles like The Red Strings Club and Heavy Bullets, but they’ve also backed established studios like Croteam, and they’re responsible for the marketing and success of the Hotline Miami series. Devolver simply supports and publishes good games, indie, obscure or otherwise, and they have enough self-awareness that they maintain a good sense of humor about it (see their hilarious E3 press conferences). 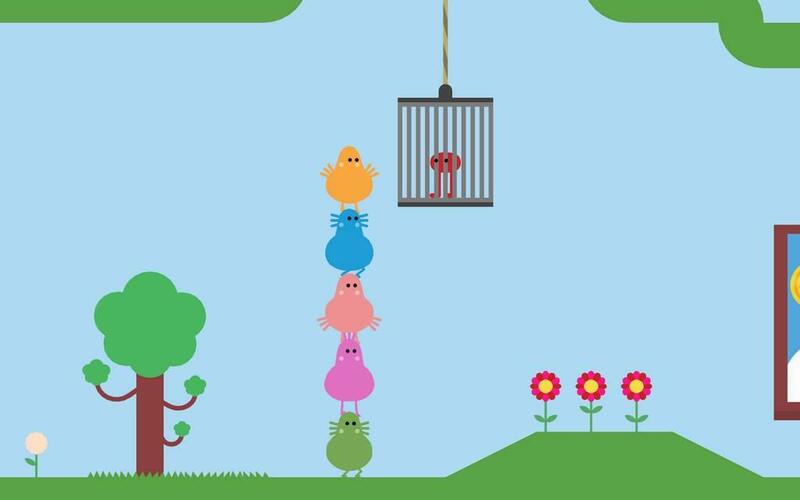 Such is the case with Pikuniku, a bizarre platformer-adventure developed by 4-man studio Sectordub. “Weird” would be an inadequate word for the game, which strangely enough lampoons and affectionately calls back to the 8 and 16-bit platformers that defined the 90s. 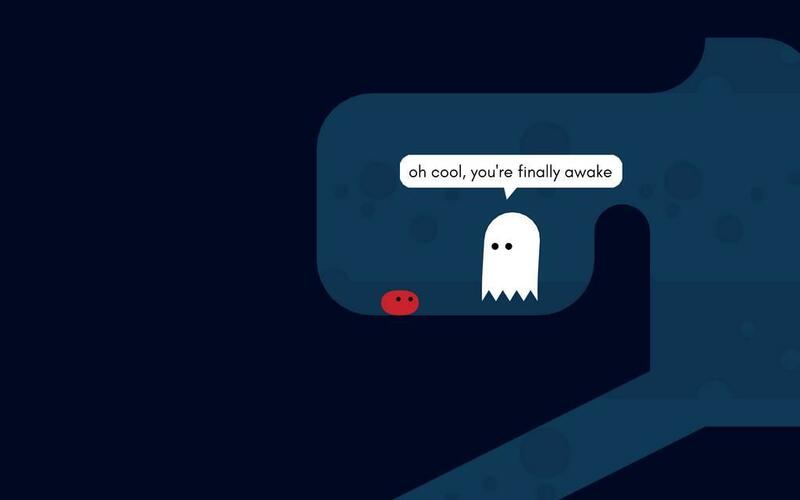 With Pikuniku, Devolver finally has the closest thing to a mascot platformer, and therefore a mascot, that the company has possessed in its nearly 10-year history. I’ve been tinkering with the game for the last week and I’m still coming to grips with what Sectordub is trying to accomplish here, and whether or not they were successful. 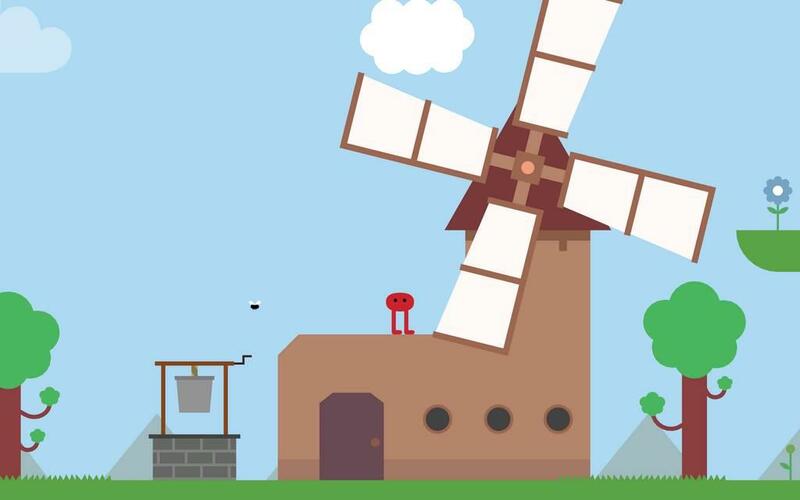 To reiterate, Pikuniku is at its core an adventure-platformer, with many similarities to the so-called “Metroidvania” genre, although I would hesitate to call Pikuniku a pure Metroidvania-style game. You begin the game by awaking in a cave. You are a small red blob with expressive eyes and two extremely stretchy and articulate legs; other than that, you are featureless. A lonely ghost gives you some tutorial exposition, after which you make your way out of the cave and into the greater world. The lumpy residents of the nearby town apparently think you’re some kind of terrible beast of legend, but you’re generally chill and help them with a number of their problems, so they decide that you are pretty cool. As you continue to explore the world you discover that the suspiciously friendly Sunshine Inc. is stealing natural resources and showering the towns with money, so very few people are complaining at the moment. 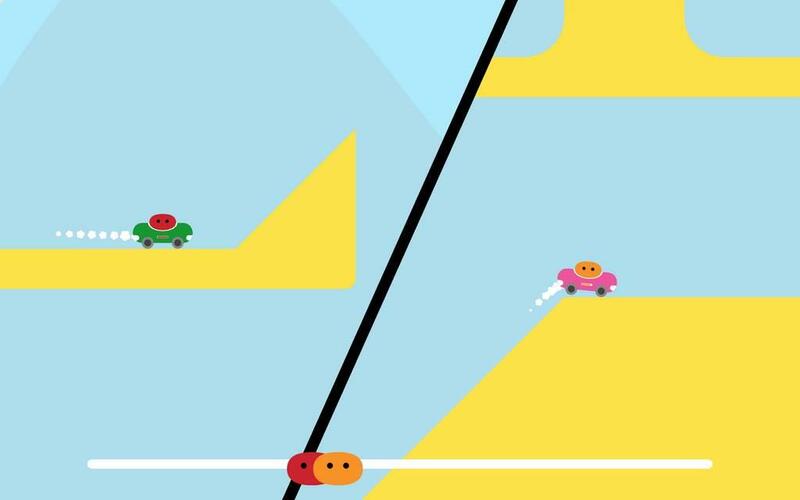 Before too long you join a local resistance and start to fight back against Sunshine Inc.
Pikuniku mostly consists of two kinds of gameplay. The first is exploring a town and engaging in various minigames and fetch-quests to make the locals happy. This includes such absurd and sundry tasks as playing a game of watermelon basketball; drawing a new face for the town scarecrow; winning a dance-off with a robot hogging the dance floor at the club; and playing hide and seek with a rock. None of these diversions are particularly challenging but they keep things fresh, and always reward you with an important item (3 apples are required to open a dungeon) or fashionable and functional hat (the water hat makes flower platforms bloom). 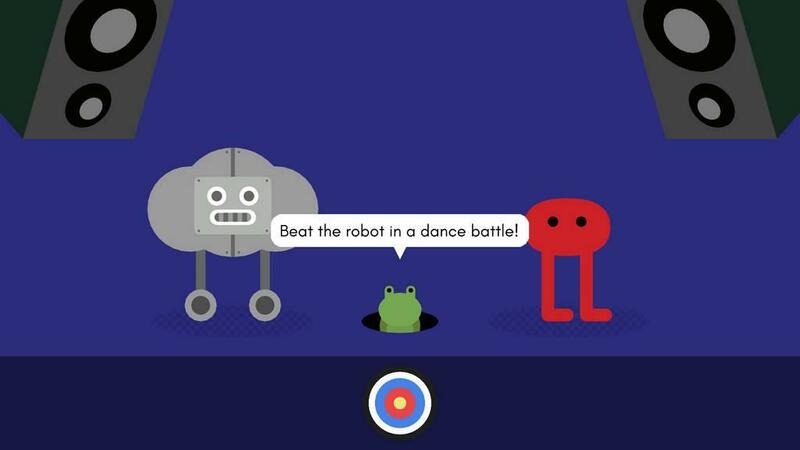 Later on in the game the fetch-questing gets reminiscent of the old Fantastic Dizzy titles, although the generous inventory and lax difficulty in Pikuniku avoid the intense challenge of those old games. Basically, you’ll often get a random doodad that will correspond to something halfway across the worldmap, although the game’s literal metro station means that it’s never a chore to backtrack. The second kind of gameplay happens in the aforementioned dungeons, and consists mainly of somewhat tricky and at times clever platforming. Your little red dude can jump, tuck in his legs and tumble kinetically like a self-propelled pebble, and hook grappling loops with his feet and swing on his springy, lanky legs. 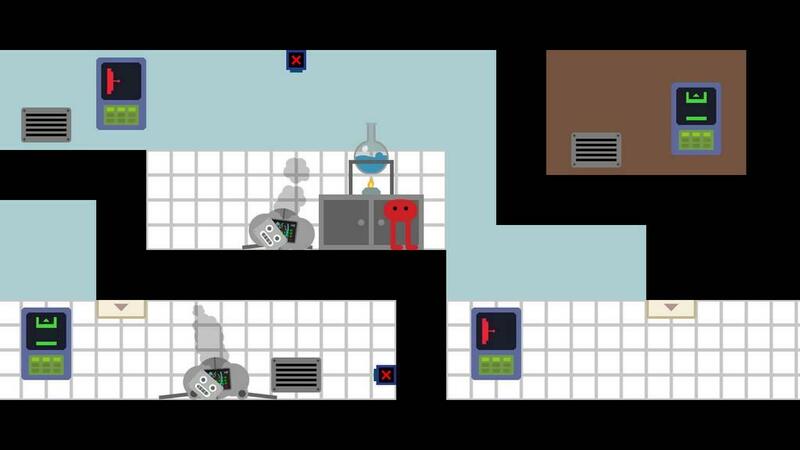 The dungeons are usually an obstacle course of hazards and switch puzzles; your ultimate goal is to activate a series of gates, water jets and explosive barrels to clear the way, typically by weighing down switches with various inert objects. Along the way you must avoid spikes, arrows and deadly pits, but “dying” is never much of a setback; it will just kick you back to a helpful checkpoint frog, who can warp you out of the dungeon if you get frustrated and want to quit. The dungeons always have a crucial hat or item at the end however, so it’s in your best interest to persevere and finish them. The problem with this platforming is that it’s entirely physics based. 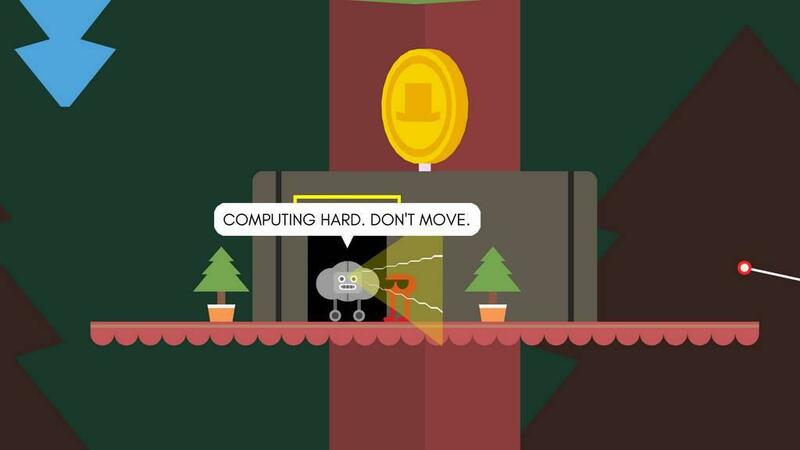 Nearly all of these puzzles require that you kick a rock, ball, or other object a certain distance to weigh down a switch, and the randomness of the physics engine can make this frustrating at times. It never gets too exasperating and I only encountered one game-breaking bug—where a squishy character I was escorting got stuck on the level geometry—but I’m not sure the goofiness was worth the randomness. 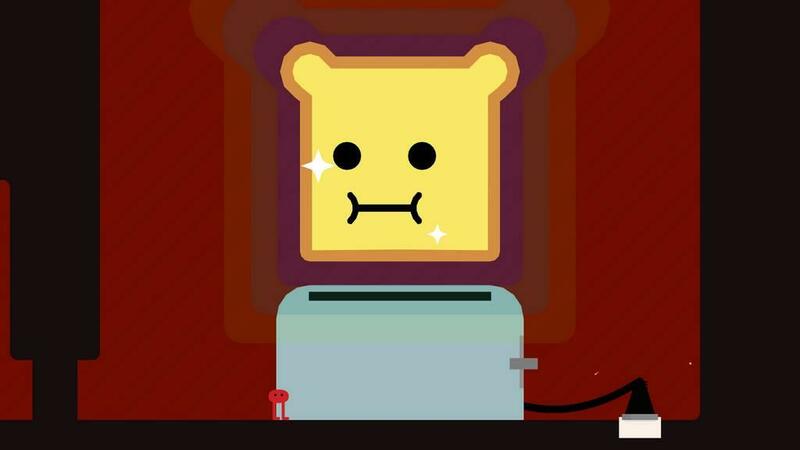 Physics-heavy games like Octodad and I Am Bread are typically fixated on the slapstick humor that results from an out of control physics engine in a 3D space; the punchline is how it’s inherently counterproductive or outright broken and the gameplay doesn’t work as it’s supposed to. 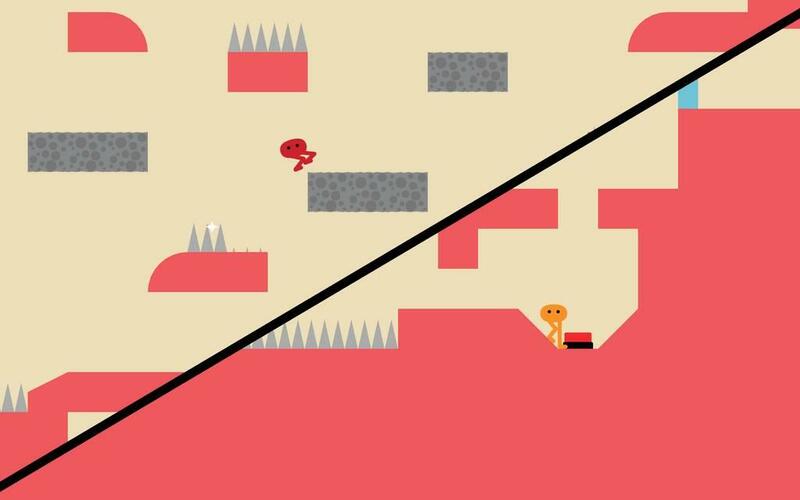 Pikuniku is clearly trying to imitate that physical humor but also treads the razor’s edge of making a mechanically-sound platformer. Because the game is in 2D instead of 3D it works much better, but I’m not sure the slapstick was ultimately worth the tradeoff in precision and playability. It works and it’s funny for a time, but it doesn’t always feel solid or satisfying. 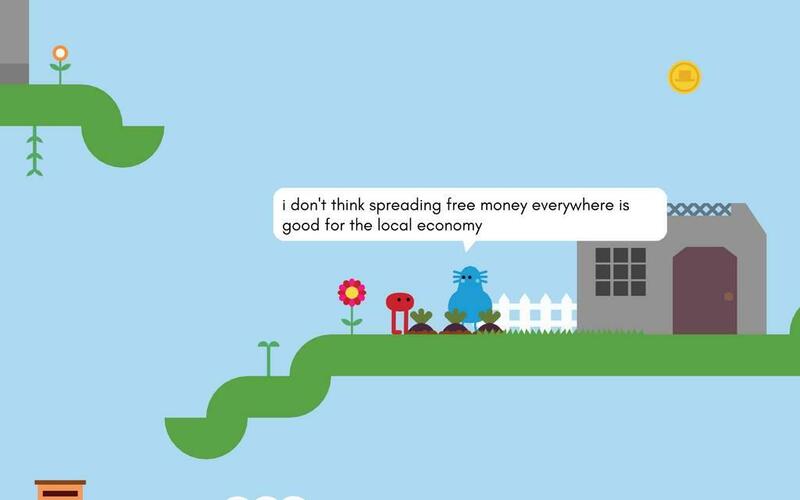 Thankfully the bulk of Pikuniku’s humor shines through in its writing. There’s an understated absurdity here that appeals to me. All of these goofy little blobby characters have a job, or a hobby, or an obsession but they are all pretty straightforward and chill about it. Oftentimes absurdist humor tries too hard and the absurdity gets shoved, unrelentingly, into your face. 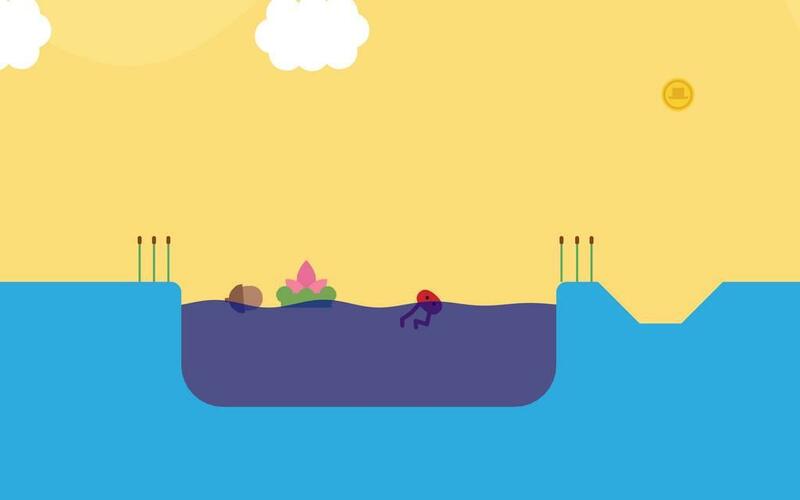 Pikuniku is a silly game in an abstract world about ridiculous things but it plays all of this (mostly) straight, which makes the jokes land much smoother and facilitates a smooth narrative and gameplay flow. This earnestly silly writing, with just a hint of winking gamer self-awareness, compliments the colorful construction-paper-cutout graphics nicely. 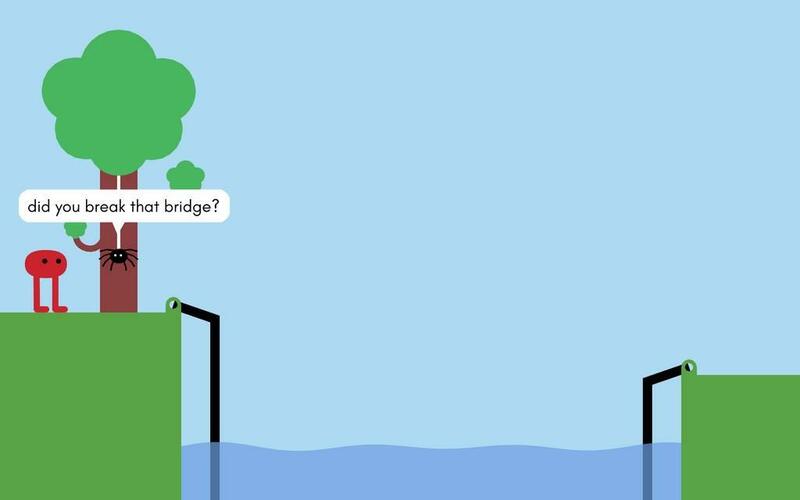 The way the gameplay, writing and visuals all complement one another…well, I hesitate to say it’s like Night in the Woods without the millennial angst and pretentiousness, but that was my first impression of Pikuniku. Then again, I’m not exactly sure who I would recommend this game to. It’s not particularly challenging, deep or narratively profound, but it is consistently funny in a wry, innocent way and outside of some physics quirks the platforming gameplay is engaging. 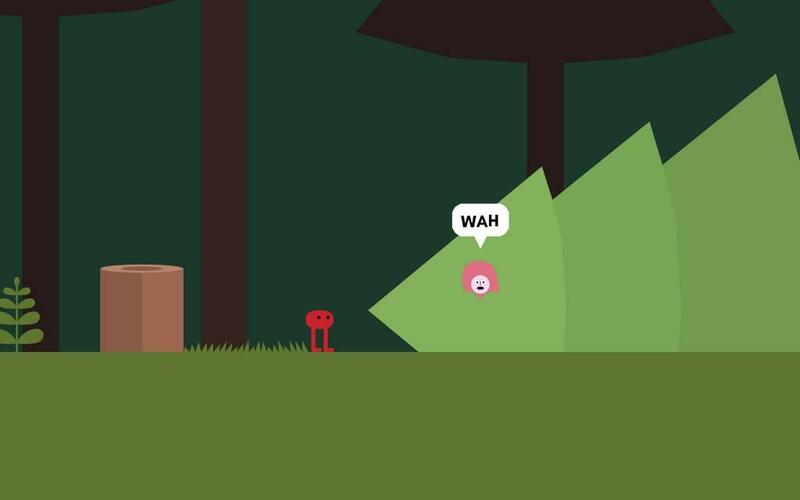 Pikuniku is a game you keep playing because you want to see how it will make you smile next; what will the next odd little character exclaim? What will the next hat let you do? What minigame is around the corner? 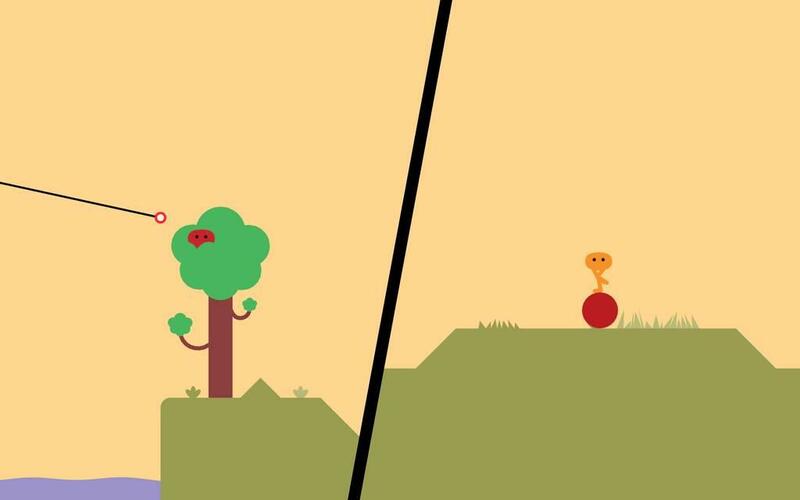 Pikuniku is arty and ludicrous without trying too hard or shoving a message down your throat, and in that regard it fits into Devolver’s stable of IP perfectly.